What does the region around Lake Fuschl have to offer? 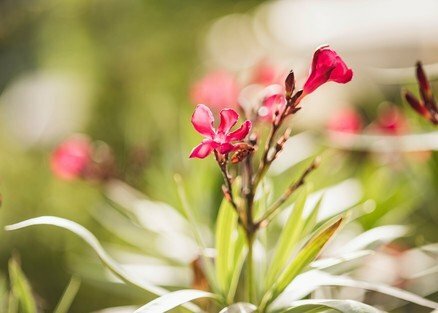 In a nutshell: There's something unique to do, see and experience in every month of every season, all year round. That is why we have put together a short overview of the most inspiring things you can experience throughout the year. 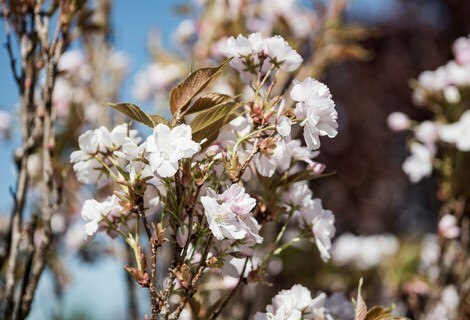 When everything comes into bloom in the Lake Fuschl Region, the desire to enjoy fresh air, nature and the sound of waves lapping the shore becomes irresistible. Spring in the Salzkammergut Lake District entices visitors and locals to enjoy gentle walks or mountain hikes and the rising temperatures lure mountain bikers back into their saddles. You can discover the wealth of the Salzkammergut’s cultural heritage and experience time-honoured Easter traditions first hand. 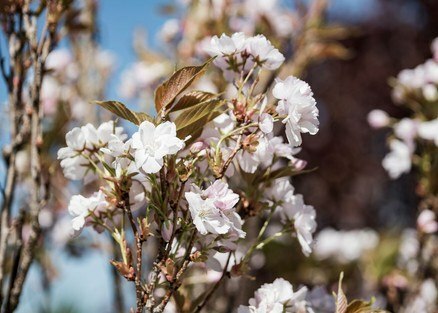 The Waldhof Alm Golf Course re-opens and on a horse-drawn carriage ride through the village of Fuschl am See you can smell and feel spring awakening. To treat yourself to something special is one thing, to do it in the company of your best friend is so much better! Here at Ebner's Waldhof you can enjoy some wonderful wellness moments together. When the first rays of spring have warmed the air, a shopping tour in Salzburg's historic Old Town is particularly nice! As fantastic as it is to have kids, it's still important to enjoy some time to yourselves. Take advantage of our great Waldhof offers for a few truly relaxing days of pampering. 1,783 metres above sea level by Austria's steepest cog railway steam train. Having reached the top you can enjoy some of the most fantastic views in the Salzkammergut Lake District and some great Alpine walking trails. Discover a wealth of traditional handicrafts and customs at the lovely Easter Market in Salzburg's historic open-air museum while going on a journey through time. Demonstrations of basket weaving and Easter egg waxing bring these traditions to life in the grounds of a museum that is a living testimony to Austria's history with original buildings from the 16th to the 20th Centuries. Men in historic uniforms on the backs on beautifully groomed horses ride through the ancient streets of Salzburg in honour of St. George. This is an ecclesiastic ceremony of century old tradition that shouldn't be missed. The summer heralds the arrival of long days of sunshine and swimming fun to the Lake Fuschl Region. Enjoy the crystal-clear waters of the lake as you swim, snorkel, fish, paddle or row. The possibilities at Ebner's Waldhof by the lake are endless: Take out a pedalo, glide silently across the water in a kayak or alternatively, simply take a seat on the hotel's own passenger boat the "Fuschlerin" - a flat-bottomed boat known as a "Zille" that is traditional for the region. The Fuschlerin departs several times a day from the lake-side promenade and will take you the entire length of the Lake to the Castle Fuschl Fishery (and back). The only thing you'll hear is the smooth lapping of the waves against the wooden hull. What other sounds of the Salzkammergut summer can you expect? The familiar clacking of clubs hitting balls on the Waldhof Golf Course, the crunching of a mountain trail under hiking boots or the dulcet tones of classical music at the world famous Salzburg Festival where the world's most renowned artists annually grace the city's stages. What puts Ebner's Waldhof a notch above the rest? Definitely its location on the shores of stunning Lake Fuschl. 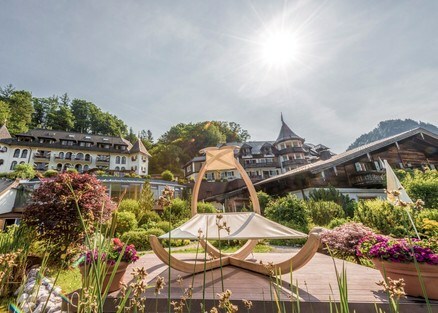 The hotel's own private beach is a haven for water lovers and sun worshipers - in combination with the fantastic Waldhof Water World, staying at the Waldhof is a dream come true! 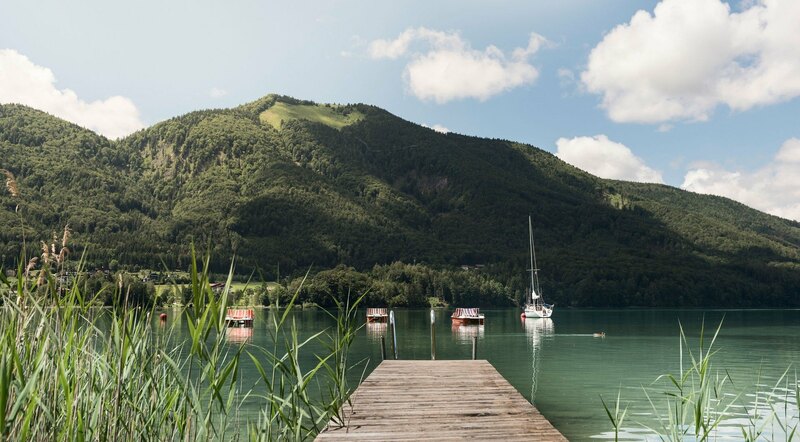 The Lake Fuschl Region in the Salzkammergut Lake District is home to numerous adventure activities just waiting to be tried out on your holiday. Whether up in the sky or on and below the ground - you can pick your own adventure. Cycling is great for your health and discovering our region on two wheels is great fun. Explore the many cycling and biking trails that stretch out into the countryside around Ebner's Waldhof by the lake. The around the lake walk is like a magnet that draws you in bit by bit. At some point during your holiday you'll feel the irresistible erge to follow the stunning path along the side of the emerald lake. The path leads you through lush meadows, cooling forests and past romantic coves. 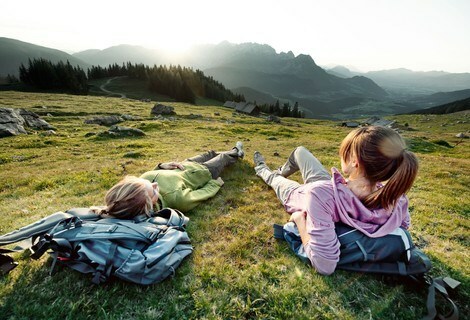 There are a whole host of excellent walks with great views to discover on the local Zwölferhorn Mountain. Enjoy clean mountain air, panoramic Alpine scenery and good traditional Austrian food at the many mountain hut restaurants en-route. 5 Fingers that will put your head for heights to the test. Autumn covers the region in a glorious robe of golds, browns and deep reds and fills our dining tables and stores with the gifts of the harvest. The annual Farmers' Autumn Festivals that are celebrated throughout Salzburg County express exactly what autumn in Austria is all about: Honouring traditional handcrafts, music, food and lifestyle. Take a walk through the stunning golden forests, enjoy the warmth of the water in the Waldhof Spa and look forward to breath-taking autumn landscapes of the Lake Fuschl Region. At Ebner's Waldhof autumn cuisine brings typical dishes of the region and the season to your table, from dusk till dawn. And the pleasant autumn temperatures make a trip to the City of Salzburg particularly pleasant! The glowing shades of autumn in the Lake Fuschl Region are a real feast for walkers' eyes. The countryside is ablaze in an amazing array of colours, the sunrays are agreeably warm and the mountain hut restaurants cosy and inviting. Treat yourself to a break before the pre-Christmas preparations start. In November a relaxing soak in the whirlpool, a soothing massage or a beauty treatment work wonders. Fishing on the lake is permitted until the end of November. Take in the calming autumnal atmosphere that Lake Fuschl emanates at this time of year while waiting for the fish to bite. Cycling from Lake Fuschl to Mondsee enables you to enjoy the glory of two lakes in one round trip: A wonderful experience, ideal for warm autumn days. Swing through the gold tinted tree tops of the forest in Faistenau: Climbing enthusiasts of all ages will feel their spirits soar when they rise above the ground on this fantastic natural climbing trail. The Gut Aiderbichl animal sanctuary is home to hundreds of animals who haven't had it so good in the past. At Gut Aiderbichl its inhabitants look forward to your visit and receiving your attention and affection. The hills and meadows that encompass the lake are mantled in a glistening white, powdery soft cloak. It's winter, the sun is shining and a day on the pistes or on the cross-country skiing tracks beckons. There's something magical about a walk through the snow-capped woods, visits to the Christmas Market are enchanting and at Ebner's Waldhof by the lake the hotel is always cosy and the welcome warm. Look forward to experiencing and indeed becoming part of the Advent traditions and Christmas celebrations. This is a serene time of year that should be enjoyed at your leisure. How about a trip to Salzburg? If it's too cold outside, you could visit the "Haus der Natur" - The city's natural history museum has a wide range of fascinating exhibits on everything to do with the natural wonders of the world to discover. visit the "Haus der Natur"
In addition to the slopes at the Waldhof Alm there are a number of natural toboggan runs in the area. The Schafbachalm is a particularly fun run for all the family. Just relaxing with a good book with time for your thoughts to wonder, undisturbed and the chance to do exactly what you like, when you like. Sound good? Then venture on a wellness holiday by yourself - we are here to ensure that you are well looked after. In the run-up to Christmas there are a number of wonderful Christmas markets in and around Salzburg to visit. Get into the Christmas spirit and enjoy the calming atmosphere of Advent in Salzburg and a warm and cosy welcome at Ebner's Waldhof. Ebner's Waldhof offers so much for families, especially in winter. 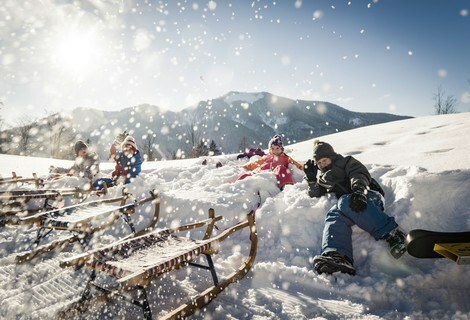 From sledging and snow-tubing to Austrian curling and sleigh rides you'll be able to make the most of your precious family time in winter.